Backyard Wood Creations was founded by Dean Garnes, an artisan and native of Bethel, North Carolina. From a young age, Garnes had an interest in carpentry and overtime became a self-taught craftsman with a passion for every facet of woodworking. In 2008, he met a professional woodturner named Von, who offered an unbelievable deal on a Lathe and some wood-turning equipment. This was the first step in making a dream become reality. In 2009, Dean started Backyard Wood Creations to pursue his newfound love of woodturning. 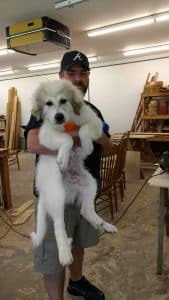 On days off from his corporate job, he works alongside his furry companion, Tex–a lovable Great Pyrenees. Garnes also spends a notable amount of time doing charitable work, such as construction and carpentry for the less fortunate. His dream is to one day retire and pursue his passion for wood-turning full-time.